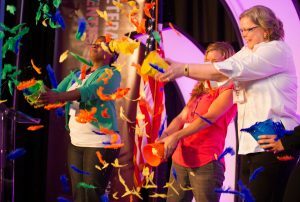 Women veterans and military spouses to gather in Charlotte, NC, Jan. 29-31, to develop their entrepreneurial skills as they seek to launch/grow their business ventures. CHARLOTTE, NC (01/26/16) — As part of its opening ceremonies on Friday evening, January 29, Veteran Women Igniting the Spirit of Entrepreneurship (V-WISE) will recognize Retired General Janet Wolfenbarger and Dr. Connie Mariano for their illustrious careers in service to our nation. The Institute for Veterans and Military Families (IVMF), the U.S. Small Business Administration (SBA) and close to 200 women veterans and military spouses from all service branches—who are attending the conference to learn business best practices, build networks, and develop their entrepreneurial skills as they seek to launch or grow sustainable business ventures—will collectively award and present Retired General Wolfenbarger and Dr. Mariano with the “FIRST” initiative honor and V-WISE Medal. “The emotion and impact of this opening event cannot be overstated,” shares Meghan Florkowski, V-WISE Program Manager, Army Veteran and military spouse. The opening ceremony will begin at 6:00 p.m., on Friday, Jan. 29, at The Westin Charlotte, 601 South College Street, Charlotte, North Carolina. For more information about V-WISE Charlotte, view Jan. 21 Press Release. At each V-WISE Conference, significant FIRSTs for women, both in the military and from across society, are recognized for their career accomplishments and societal contributions. Past FIRST honorees include Colonel Jill Willig Chambers, Lieutenant General Flora D. Darpino, Major General Irene Trowell-Harris, CSM Michele Jones, Major General Marcia Anderson, Lieutenant General Patricia Horoho, General Ann Dunwoody, Major General Gina Farrisee, and CSM Cynthia Pritchett. General Janet C. Wolfenbarger was commissioned in 1980 as a graduate of the U.S. Air Force Academy, and began her career in acquisition as an engineer at Eglin Air Force Base, Fla. She has held a variety of assignments at headquarters Electronic Security Command and Air Force Systems Command. The general has held several positions in the F-22 System Program Office at Wright-Patterson AFB, served as the F-22 Lead Program Element Monitor at the Pentagon, and was the B-2 System Program Director for the Aeronautical Systems Center (ASC), Wright-Patterson AFB, Ohio. She commanded ASC’s C-17 Systems Group, Mobility Systems Wing. She was the Service’s Director of the Air Force Acquisition Center of Excellence at the Pentagon, then served as Director of the Headquarters Air Force Materiel Command (AFMC) Intelligence and Requirements Directorate, Wright-Patterson AFB. She served as AFMC vice commander from December 2009 to September 2011. General Wolfenbarger next served as the Military Deputy, Office of the Assistant Secretary of the Air Force for Acquisition, the Pentagon, Washington, D.C. General Wolfenbarger culminated her career as the Commander, Air Force Materiel Command, Wright-Patterson Air Force Base, Ohio. The command employs some 80,000 people and manages $60 billion annually, executing the critical mission of warfighter support through leading-edge science and technology, cradle-to-grave life cycle weapon systems management, world-class developmental test and evaluation, world-class depot maintenance and supply chain management, and world-wide installation and mission support. General Wolfenbarger retired from the US Air Force on 1 July 2015, after a 35-year career of dedicated service to the nation. Dr. Connie Mariano is used to breaking barriers, used to shattering the glass ceiling. Born to a Navy steward and his wife in the Philippines, Dr. Mariano lived the life of a family in the American armed forces. Her life has been filled with many achievements: high school valedictorian, graduate with honors at the University of California at San Diego, medical degree from the Uniformed Services University School of Medicine, and a distinguished 24-year career in the U. S. Navy. After leaving the White House in 2001 following nine years and service to three sitting American presidents, Dr. Mariano became a consultant in the Executive Health Program at the Mayo Clinic in Scottsdale from July 2001 to October 2005. In November 2005, Dr. Mariano founded the Center for Executive Medicine, a medical concierge practice which provides presidential-quality medical care to CEOs and their families. An expert in presidential health care including the 25th Amendment to the Constitution, Dr. Mariano is a frequent guest speaker on television and print media on the topics of care to VIPs, presidential disability, travel medicine, and optimizing quality of care. Dr. Mariano is the former medical director of the National Academy of Future Physicians which hosts the Congress of Future Physicians and Medical Scientists twice a year to inspire and guide high school scholars into the fields of medicine and science. She is on the board of Phoenix Children’s Hospital. V-WISE was created by the Institute for Veterans and Military Families (IVMF) and the Martin J. Whitman School of Management at Syracuse University in partnership with the U.S. Small Business Administration (SBA). Attendees of the conference will receive in-depth instruction from prominent business owners, leadership consultants, educators, veterans and other experts who will help shape their development as entrepreneurs. Sessions will focus on business planning, marketing, accounting/finance, business law, technology for business, human resources and work-life balance. V-WISE has impacted more than 1,900 women veterans and military spouses from all service branches and eras in over 46 states. More than 65% of V-WISE graduates have started or expanded a business. More than $41 million in revenue has been generated by V-WISE graduates, and 93% of those businesses are still in operation today! To learn more about V-WISE and to apply online for future conferences, visit IVMF. nice sharing. I will contact you.